Daviess County ( /ˈdeɪvᵻs/ or incorrectly /ˈdeɪviːz/), is a county in the U.S. state of Kentucky. As of the 2010 census, the population was 96,656. 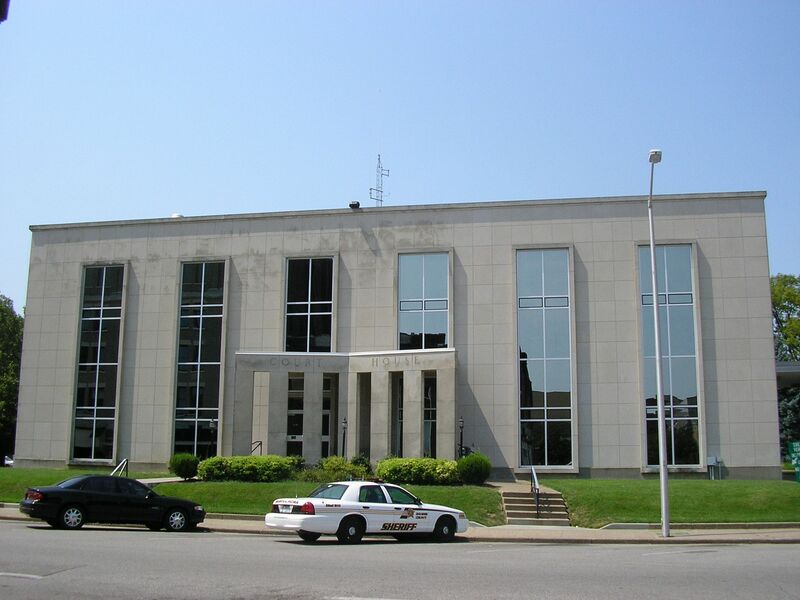 Its county seat is Owensboro, which was named for Colonel Abraham Owen, killed at the Battle of Tippecanoe. The county was formed from part of Ohio County on January 14, 1815. Daviess County is included in the Owensboro, KY Metropolitan Statistical Area. Daviess County also shares its namesake with another nearby Daviess County of Indiana. Both Counties are in the Illinois-Indiana-Kentucky Tri-State Area. Daviess County was established in 1815. The county is named for Major Joseph Hamilton Daveiss (a recording error in the State Clerk's office accounts for the error in spelling, which was never corrected), the United States Attorney who unsuccessfully prosecuted Aaron Burr. The county's borders were altered in 1829 to form Hancock County, in 1830 to absorb a small area surrounding Whitesville, in 1854 to cede land to McLean County, and in 1860 to annex 44 square miles (110 km2) from Henderson County. The courthouse burned in January 1865 during the American Civil War, but because the county records had been transferred to a church they were spared destruction. According to the U.S. Census Bureau, the county has a total area of 477 square miles (1,240 km2), of which 458 square miles (1,190 km2) is land and 18 square miles (47 km2) (3.8%) is water. The northern half of the county along the Ohio River is relatively flat, with a few rolling hills dotting the landscape. The southern portion is mostly rolling hills mixed with flat valleys. The southern portion was mined for coal in the past, especially in the rolling hills along Panther Creek and other streams. As of the census of 2012, there were 97,847 people, 36,033 households, and 24,826 families residing in the county. The population density was 198 per square mile (76 /km2). There were 38,432 housing units at an average density of 83 per square mile (32 /km2). The racial makeup of the county was 93.69% White, 4.35% Black or African American, 0.13% Native American, 0.43% Asian, 0.02% Pacific Islander, 0.44% from other races, and 0.94% from two or more races. 0.92% of the population were Hispanic or Latino of any race. There were 36,033 households out of which 32.90% had children under the age of 18 living with them, 53.60% were married couples living together, 11.80% had a female householder with no husband present, and 31.10% were non-families. 27.10% of all households were made up of individuals and 11.10% had someone living alone who was 65 years of age or older. The average household size was 2.47 and the average family size was 3.00. In the county, the population was spread out with 25.80% under the age of 18, 9.00% from 18 to 24, 28.40% from 25 to 44, 23.00% from 45 to 64, and 13.80% who were 65 years of age or older. The median age was 37 years. For every 100 females there were 92.60 males. For every 100 females age 18 and over, there were 88.30 males. The median income for a household in the county was $36,813, and the median income for a family was $45,404. Males had a median income of $35,295 versus $21,971 for females. The per capita income for the county was $18,739. About 9.40% of families and 12.30% of the population were below the poverty line, including 15.60% of those under age 18 and 11.40% of those age 65 or over. Daviess County has long had a reputation as the leading center of the production of distilled spirits, chiefly Kentucky bourbon. Walter McFarland, who moved here from North Carolina, began making whiskey and peach brandy in about 1804 on a 200-acre (0.81 km2) estate just south of Panther Creek, on today's U.S. 431. Cornelius Westerfield also began distilling corn whiskey in the early 1800s on his farm three miles (5 km) southwest of Whitesville, Kentucky, on Deserter Creek. It finally closed in 1872, after more than 60 years of production. By the 1880s, 18 large distilleries operated in Daviess County at the same time. Today only three remain. One dates back to 1869, the former Glenmore Distillery Company, which was originally the R. Monarch Distillery. Charles Medley Distillers Kentucky is at least the 59th distillery in the county's history. Trinidad-based Angostura Limited bought the Medley Distillery in 2007 with plans to make its entrance into the world's bourbon market, but the severe global recession slowed plans for starting bourbon production in Daviess County for the first time since 1992. The southwestern portion of the county around the Panther Creek area was heavily mined through the 1960s till the early 1990s. After 1998 large tracts of mined land were left unclaimed. Then after a lengthy search for contractors by the state government's Division of Abandoned Mine Lands, work commenced on the largest tract, a 42-acre (170,000 m2) tract once part of the now defunct Green Coal Company. The 42 acres (170,000 m2) of unclaimed land were part of Green Coal Company's mine once known as the "Panther Surface Mine". Green Coal Company was a staple mining company in Daviess County and was based nearby in Henderson. ^ a b "State & County QuickFacts". United States Census Bureau. Archived from the original on July 9, 2011. https://www.webcitation.org/603EInzaG?url=http://quickfacts.census.gov/qfd/states/21/21059.html. Retrieved March 6, 2014. ^ Rennick, Robert M. (1987). Kentucky Place Names. University Press of Kentucky. pp. 78. https://books.google.com/books?id=3Lac2FUSj_oC&lpg=PA49&dq=cannon%20ky&pg=PA78#v=onepage&q=cannon%20ky&f=false. Retrieved 2013-04-28. ^ Hogan, Roseann Reinemuth (1992). Kentucky Ancestry: A Guide to Genealogical and Historical Research. Ancestry Publishing. pp. 223. https://books.google.com/books?id=hAVlVS29NKIC&lpg=PA193&dq=%22bell%20county%22%201914%201918%201976&pg=PA223#v=onepage&q=%22bell%20county%22%201914%201918%201976&f=false. Retrieved 26 July 2013. ^ "U.S. Decennial Census". United States Census Bureau. Archived from the original on May 12, 2015. https://www.webcitation.org/6YSasqtfX?url=http://www.census.gov/prod/www/decennial.html. Retrieved August 13, 2014. ^ History of Daviess County, Ky., pgs 341–345, Interstate Publishing Company, Chicago, Ill. This page uses content from the English language Wikipedia. The original content was at Daviess County, Kentucky. The list of authors can be seen in the page history. As with this Familypedia wiki, the content of Wikipedia is available under the Creative Commons License.